Following the successful conclusion of the Thirty Meter Telescope’s Environmental Impact Statement and Final Design Review of the observatory enclosure, TMT worked with acclaimed science animator and producer Dana Berry on a new, more accurate set of renderings of the observatory and its support building as they will appear on Mauna Kea. These renderings accurately portray the observatory with a reflective dome. This aluminized coating was selected to help the observatory maintain a constant temperature and to blend in with the surrounding environment. The dome will reflect the color of the local lava field during the warmer months and will appear white when snow covers the top of the mountain. 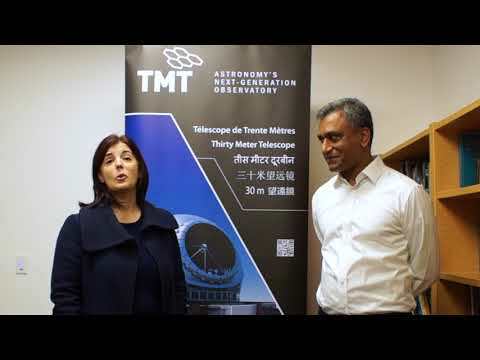 TMT worked with acclaimed science animator and producer Dana Berry on a new, more accurate set of renderings of the observatory and its support building as they will appear on Mauna Kea. The new images also demonstrate how the support building and access road will utilize native rock and colors to better match the local environment. The telescope will be sited on the northern plateau of Mauna Kea at a location known as 13 North within Area E. This section of the mountain, which was identified as the preferred site for a next-generation optical observatory in the 2000 Mauna Kea Reserve Master Plan, is below the summit and its predominant geologic feature is a basalt lava flow. This particular rock has weathered to a reddish hue, which influenced the exterior appearance and color choices of the observatory.